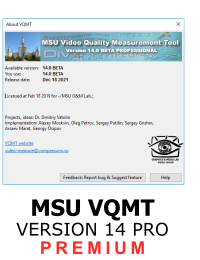 If you are already our customer, you can get the latest version of VQMT with support for one year with 50% off! 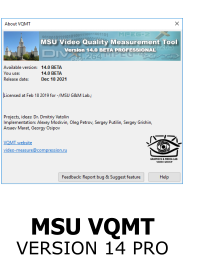 Please, contact us to obtain discount code: video-measure@compression.ru. Remember! Free version is limited and only for personal use. Please, purchase PRO if you are using VQMT in company. To use VQMT FREE on Linux you can run windows version under Wine.